Turkish PM Recep Tayyip Erdogan just can’t get a break these days. The beleaguered, but defiant PM did not let recent demonstrations in several parts of Turkey derail his plans for a North African tour early this past week. First stop in his Maghreb visit was Morocco, where he was received by his counterpart Prime Minister Abdelilah Benkirane, who has long sought to model his Islamist party, the Justice and Development party (PJD) along the lines of Erdogan’s AKP government. 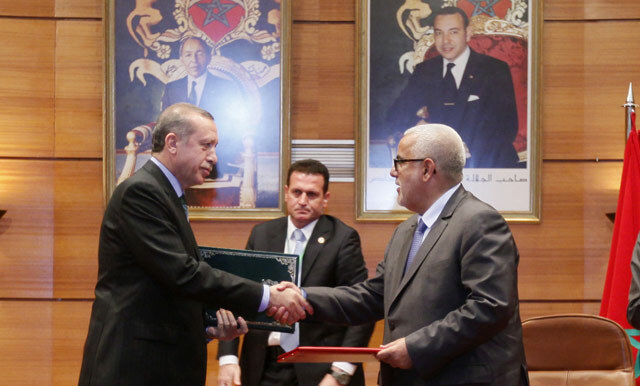 This was supposed to be an important trip for both Turkey and Morocco, and a crowning moment for Benkirane’s government. Any visit from such an important state delegation is almost always granted a royal séance with His Majesty, King Mohammed VI. 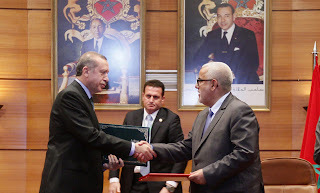 This was particularly expected in this instance, after Morocco’s Minister of Foreign Affairs Saad Eddine al-Othmani promised his Turkish counterparts that the king would in fact meet with Erdogan. To everyone’s surprise and Benkirane’s embarrassment, the king did not visit with Erdogan during his abbreviated one-day stay in Morocco. King Mohammed VI was not even in the country, having been in France since May for undisclosed reasons. The palace-coopted business association confédération générale des entreprises du Maroc (CGEM) also boycotted Erdogan’s visit, refusing to meet with the Turkish prime minister. Erdogan is said to have been royally angry at the cold reception he received in Morocco and with the king’s failure to meet him. A photo op between Erdogan and Benkriane is telling, showing a tense Erdogan and an uneasy Benkirane, who is perhaps diffusing the situation and making excuses for his majesty’s absence. On the next leg of his trip, Erdogan visited Algeria where he was again snubbed, this time by President Abel‘Aziz Bouteflika, who coincidentally was also in France at the time. In Morocco, Erdogan’s visit amplified discussions about the whereabouts of the country’s sovereign. Was the king avoiding Erdogan for political reasons? Was it an assiduous move by the palace to embarrass its embattled PJD-led government? Or was the king simply unavailable to meet foreign dignitaries for reasons beyond anyone’s control? In addition to domestic political reasons, rumors have been swirling about the king’s long hiatus. Some suggest that the king is “gravelyill” and probably receiving medical treatment in his chateau in Betz, France. The king’s medical status is a sensitive state issue, about which mere speculation could lead to judicial prosecution. IdrissChahtane, the editor of the Moroccan weekly news publication al-Misha’al, was sentenced to a year in prison in 2009 for a story about the king’s health. Neverthless, speculation about the king’s trips abroad is always rife. Moroccan journalist Ali Anouzla wrote an excellent editorial in the independent Moroccan news website Lakome on the king’s recent absence. Anouzla calculated that between January and June 2013, the king has been abroad for 57 days, none of which has been publicly disclosed by the palace. Nor did the king formally empower any other branch of government to run state affairs in his absence. Morocco’s monarch, unlike heads of state in other countries, is under no obligation to disclose his official business or holiday calendar. The Ministry of Palaces and Protocol and the king’s palace staff serve at his pleasure, and are not subject to any legislative or judicial oversight. The king’s movement and related expenses are confidential and are beyond any form of accountability. His absence is nothing new to the average Moroccan - most do not even know when he is and is not in the country. Despite the on-going protests in Turkey, Erdogan continues to be among the most popular figures in the Middle East and North Africa region. The palace knew this visit could have been a crowning moment for Benkirane’s government, and may have wanted to minimize its importance to undermine any political dividends that could accrue to the PJD. The PJD government has scrambled to dismiss negative reports about the Erdogan trip, arguing that the visit was a resounding “success.” These days, the PJD is in need of any sort of political victory, as a schism created within its parliamentary coalition by the Istiqlal party continues to fester. The Istiqlal’s mercurial Secretary General Hamid Shabat, announced in May that his party will be withdrawing from the government coalition with PJD because of differences over planned socio-economic reform policies of the PJD government. The monarch long seen as the arbiter within a tightly controlled political environment in Morocco, intervened personally from his vacation in France to convince Shabat to stay put until his return. Shabat and Istiqlal have been calling for greater power within the PJD-led government, and this could be part of a strategy to force the PJD to reshuffle the government with more ministerial portfolios given to the Istiqlal. This political crisis also highlights the palace’s role in diffusing fabricated tension in the Moroccan fragmented party scene. Even away from the country, the king remains firmly in control of all the levers of power, as even Shabat is said to be waiting for royal instructions about his party’s withdrawal. That is whenever the king comes back from his long hiatus, which seems to have caused quite the stir. Abdallah Bouanou, the head of the PJD in parliament, stated that the reasons for cancelation of the royal meeting with Erdogan are unknown. There is no doubt that PJD is not privy to reasons for the royal absence, but it is difficult to fathom that within the edifice of a supposed modern state, the highest echelons of political power have no clue as to the cause for such poor diplomatic planning. We may never know the true reasons for this fiasco, but the fact remains that Erdogan’s visit came and went without the usual pomp and circumstance accorded to foreign dignitaries of his stature. No red carpet was laid out before the royal palace, and that has definitely left a bad taste in Erdogan’s mouth as he continues to fight his own battles at home in Turkey. As for the king of Morocco, reports suggest that he will go to Turkey on an official visit in the near future, perhaps in an effort to make amends for the “snub”, and personally offer polite excuses his own subjects in Morocco may never hear about.